The Motorcycle Files is a series of short but hugely-informative e-books that are priced relative to their size and the quality and rarity of their content. The series presents you with a unique opportunity to build your own library of road and track tests of some of the world’s rarest motorcycles. 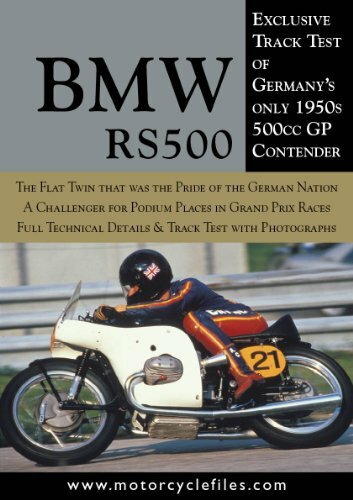 The subject of this e-file, for example,focusses upon the BMW racer with which the German factory challenged for World Championship honours in the nineteen-fifties. journalist and former racer, Alan Cathcart. He has been testing road and racing motorcycles all over the world for more than thirty years and this, allied to a successful racing career, has earned him the respect of all of the major motorcycle manufacturers, museums and private owners of priceless two-wheeled rarities. In many cases the machines that he has tested for The Motorcycle Files are the only existing example in the world. And Alan’s unique combination of riding ability and journalistic skills means that manufacturers are willing to open the doors to their factory team race shops to him and then allow him to test on the race track the machines that are usually restricted to World Championship Grand Prix and Superbike racers. The Motorcycle Files, therefore, are the only publications that can offer you the chance to build up your own library of information on some of the rarest machines on the planet. Each file includes the track or road test, plus technical information and the historical background of the featured machines. Added to that, The Motorcycle Files has utilized the skills of some of the best motorcycle photographers in the world to provide unrivalled action and technical images. No other series can strip the fairings from the racing machine and allow you a close-up look at the engines and other technical details usually seen only by the race team engineers. The initial releases in The Motorcycle Files series will focus upon a selection of the most famous racing machines of the past – machines that competed in the decades from the nineteen-twenties to the ‘eighties. Future releases will feature more classic racers and road machines as well as recent contenders for MotoGP and World Superbike Championship honours.